Chinese believe heat in the body can cause all sorts of health problems. This heat is caused by very warm weather and/or eating too much heaty food like fried food, durian etc. This heat in the body called 熱氣 read as 're chi' translated as 'heat gas', can cause heat rash, sore throat, mouth ulcers, heat headaches etc.... To cure/relieve this heat in Chinese referred as '清熱解毒 chin re jae duk' translated as 'relieve heat clear poison', there are many Chinese herbs and food that can use as a cure or prevention. Mung beans are one of the best food to cure/prevent heat in the body, eaten as beansprouts or use the dried beans in cooking. Mung beans are 'ying' or 'cool' food. These tiny green beans are probably the cheapest and best medicine for summer/warm weather heat problems or if someone has eaten too much fried food or bad hangover. Whenever the weather getting very warm and uncomfortable, my mum always made us eat a lot of beansprouts and use the dried beans to boil soup, savoury or sweet. 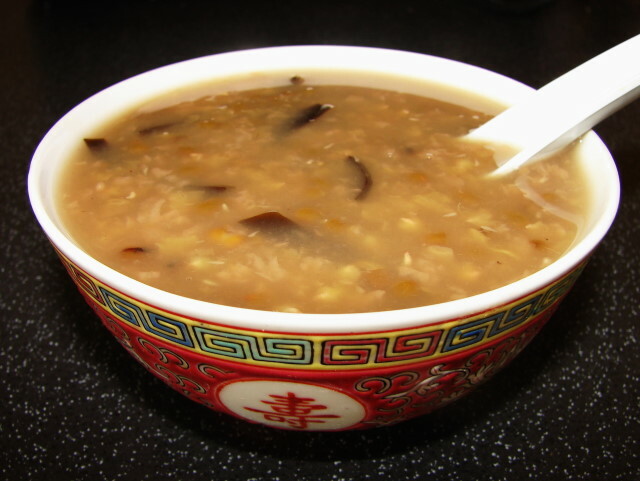 A popular sweet dessert soup most Chinese recognised is 綠豆沙 'read dou sa' sweetened mung bean soup. There are various recipes, easiest is boil mung beans with plenty of water till very soft and sweeten with sugar, eaten hot, warm or cold. One recipe I like very much is mung bean soup with kelp and common rue 臭草海帶綠豆沙. Chinese use common rue as a eaten herb which has a distinctive flavour, because it smells so strong we called it smelly grass 臭草. I bought some seeds to grow rue last year but they never come out. If anyone has a live plant to share in UK, please let me know love to grow some for this soup I so longed for. Without rue, I have to find alternative. This recipe I am sharing with you today is just sweet soup with mung beans, kelp (kombu) and flavoured with some dried tangerine peel to give a different but nice citrusy flavour. The kelp or kombu used is either Chinese, Japanese or Korean. The texture is similar to woodear 木耳. Some kelp or kombu can be green some brown to black. Use any you can find or have in the cupboard. Green kelp is softer or more gelatinous. Beans can be soaked or not soaked. Glutinous rice just rinsed. Kombu soaked till soften then shredded with scissors/knife to very fine shreds. Tangerine peel soaked till soften then shredded very fine. Put everything in stock pot add about 10 - 11 cups of water and boil. When water is boiling, lower heat and simmer for about 1.5 to 2 hours till everything is very soft and tender. Stir the soup, every 20 - 30 minutes (scrape the pot bottom) during cooking to prevent sticking. Add few lumps of rock sugar to taste, add 1- 2 lumps at a time till dissolves, taste and add more if required. Serve hot, warm or cold as a dessert soup. Great eaten with Chinese crueller/Chinese fried bread sticks (you tiao 油條), not just a counterbalanced combo but also good flavour combination, good combo for breakfast too. I always have some of this soup hot. Any left over leave in the fridge and eaten cold in the next few days. If you don't like sweet soup you can flavoured with some salt, or boil the soup with chicken or pork bones for a more savoury flavour. If you like to speed up the cooking time, can add 1 tsp bicarb with the water. Sago pearls can replace glutinous rice, soaked and add in at the last 10 - 15 minute, cook till pearls all turned translucent. If you have fresh common rue and like its flavour, add a small handful leaves and stems together. Add in about last 30 minutes, remove after cooking. Hi sunflower, how appropriate you should post this recipe after our chat on BBC yesterday!!! I am unable to get kelp here, what could I use as an alternative? or maybe just leave out? You can leave out the kelp. This recipe is a lightly thickened soup. You can make congee a much thicker rice soup with ordinary rice, 1:1 (vol) rice and beans and same amount of water about 10:11 cups for 1 cup of beans. Better soak the beans. For congee better boil beans first for 30 min then add rice, can cook till rice and beans are softened. For savoury flavour using meat or veg stock, for sweetened just water and sweetened with rock sugar or plain sugar.